LOS ANGELES (AP) — Rather than pop, Ronald Acuna Jr. started the game with a popup. The big-hitting rookie never got into the swing at Dodger Stadium, and neither did the rest of the Atlanta Braves. 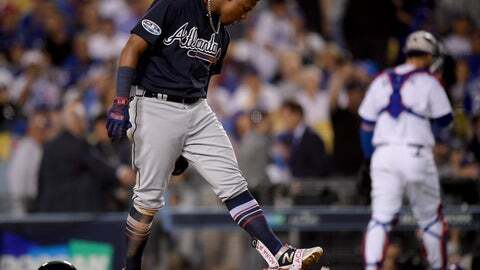 Hoping to break loose in their first postseason appearance since 2013, the Braves instead were blanked on six singles Thursday night, losing 6-0 to the Los Angeles Dodgers to begin the NL Division Series. Acuna and fellow rookie Ozzie Albies were held in check, as were veterans Freddie Freeman and Nick Markakis. Atlanta never got a runner past second base against Hyun-Jin Ryu and trio of Los Angeles relievers. Acuna, who was 0 for 4 and struck out twice, said he didn’t think there was any pressure participating in his first postseason game. “Never, to be honest. I don’t see any need to put any unnecessary pressure on ourselves,” he said. Two hallmarks that propelled the Baby Braves to 90 wins and the NL East title were nonexistent in Game 1 — solid starting pitching and timely hitting. Atlanta though has continued a late-season offensive slump as this was the third time in the past six games they have been shut out. The Braves have scored three or more runs just once in their past six. All-Star Mike Foltynewicz, Atlanta’s best pitcher all season, allowed four runs on three hits in two innings. The right-hander, who had not allowed a home run in four of his last five starts, allowed two longballs, including a leadoff drive by Joc Pederson on his third pitch. Foltynewicz threw 28 pitches in the first and almost didn’t get out of the inning. He loaded the bases with two outs before striking out Yasiel Puig. Foltynewicz got into more trouble in the second inning, allowing a three-run shot to Max Muncy after hitting Pederson with a pitch and walking Justin Turner. Foltynewicz said that he had the same feelings as if it were a regular start, but manager Brian Snitker thought that pitching in his first postseason game might have gotten to him. The 20-year-old Acuna reached on shortstop Manny Machado’s error to lead off the sixth but was caught stealing when he missed a sign from third base coach Ron Washington. “It was just a kid, I think, that was out there and thinking that his teammate’s going to put that ball in play and he’s going to try to help make something happen,” Snitker said of the missed sign. The 21-year-old Albies was 1 for 4 and 24-year-old Johan Camargo was hitless in four tries. Snitker’s overall assessment of his team? “I think they were jacked up and excited, and it’s a big moment to this point in their career, Folty included. And take nothing away from what he did all year, I mean. And it was good for him to experience this,” Snitker said. Sean Newcomb, mentioned by Snitker before Thursday’s game as a possibility to start Game 3 on Sunday, was the first pitcher out of the bullpen and went two innings. That would leave Kevin Gausman and Julio Teheran as the likely starters. The Braves’ task of evening up the series on Friday could be one of their more difficult games of the season as they face Dodgers ace Clayton Kershaw. Anibal Sanchez, who will start for the Braves, didn’t seem that fazed about the matchup.